In prior posts we have discussed ROI vs. TCO: What’s Best for your Business? and 9 Winning Reasons to Use a TCO Tool. 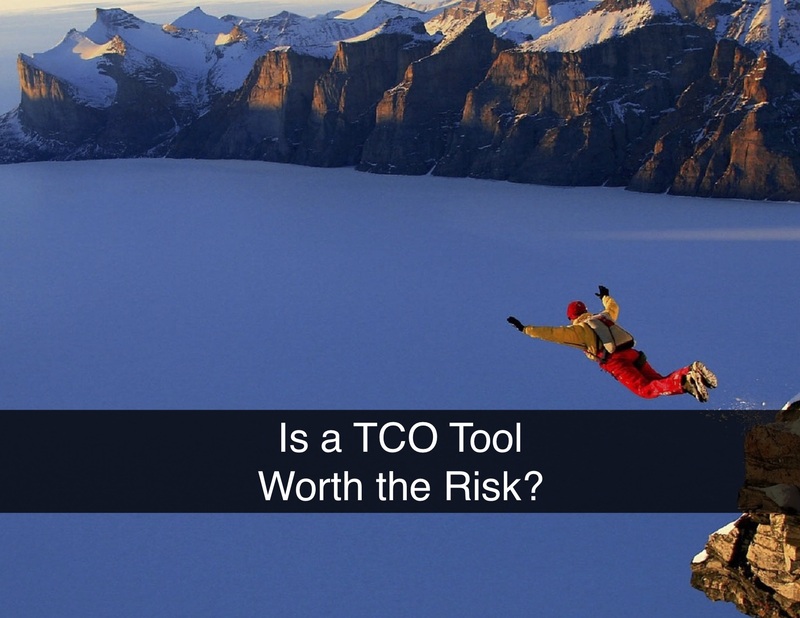 Today, we are focusing on the risks associated with using a TCO tool in the wrong situation. Let’s begin with a basic definition of a TCO analysis and its corresponding tool. A TCO analysis compares two alternatives to determine which one will deliver the lowest total cost of ownership (which is presumed to be the best outcome) over the lifetime of the solution. This takes into account both the initial purchase and implementation costs. It also considers the ongoing costs associated with both options, which can include subscriptions, maintenance, training, support, energy, replacement and other potential costs. A thorough TCO analysis should go beyond these costs. To be truly helpful, it must also consider differences in the value derived from both solutions, such as productivity gains, revenue gains, reductions in employee turnover and improved yields. A well-designed TCO tool should help buyers determine the best overall financial choice between those two options... a decision that’s not entirely predicated on cost. This leads us to the first risk associated with a TCO analysis. A TCO analysis compares two options. It does not necessarily find the best option, it just shows which of the two being evaluated is better. In the end, neither alternative may be the best possible solution. Imagine determining the TCO of heating your house using either coal or fuel oil. Your analysis may show that fuel oil has a lower TCO, but is it really the best solution? Even if you ignore the environmental impact and just focus on the economic impact, heating your home with either fuel oil OR coal is a bad financial decision. Why? Because there are other more cost-effective options (natural gas, electric, propane, geothermal, etc.) that were not included in the TCO analysis. This is an extreme example but it illustrates a common risk inherent to a TCO analysis: overlooking the best solution by comparing two lesser alternatives. Suppose the two options being evaluated are actually the two best alternatives for the problem at hand. Showing that your solution has a better TCO does not necessarily cost-justify either alternative. As stated before, it just shows which one is better between the two. Suppose a customer has $1M to invest in improving their operations. One of the things being considered is a problem that your solution solves. The TCO analysis shows your solution’s TCO is $50K less than your competitor’s. This should help the customer determine which solution they should buy, right? Before you come to a conclusion, let’s broaden the lens. What if the customer is also evaluating other ways to spend that the money? Even if your sponsor isn’t doing so, someone else within the organization probably is. As it stands, the TCO analysis doesn’t show the ROI, Net Present Value (NPV) or payback period of your solution. These and other financial metrics are exactly what the CFO and finance people need when evaluating where to invest their money. So even though your solution has a $50K lower TCO, it may still not meet the required investment hurdles. Consider that your solution requires a $500K investment and delivers a $100K Net Present Value. That seems good, right? What if another project under consideration in a completely different area requires a $1M investment but delivers a $1.5M NPV? Although investing in your solution delivers a positive ROI and NPV, it precludes the company from investing in the other project which has a much higher ROI and NPV. None of this is reflected in the typical TCO analysis. A few years ago we published a blog post about The Etiquette of Talking about Your Competition. In all situations, it is best to speak honestly and positively about your competitors. Because a TCO tool is inherently designed to show the disadvantages of your competitor, there are several side effects that could risk the sale as well as your reputation. · A TCO tool is likely to provide your competition with ammunition to refute your claims and improve their offerings. · Things change over time, so the TCO analysis must always reflect the latest reality of both offerings. Misrepresenting the competition will not reflect well on you. · Negative selling is likely to leave a negative impression on your prospective customer. If it does, they may choose not to do business with you, regardless of your offering. We believe this is the most important reason to proceed with caution when deploying a TCO tool, because it carries the highest potential risk. The foundation of a TCO analysis is comparing your solution to a specific alternative. In most cases, that alternative will be one of your direct competitors. Chances are the customer already knows who the players are in your market. But if their research is incomplete and they are not familiar with the other company in your TCO analysis, you have inadvertently introduced a prospective customer to yet another competitor. With all of that said, there are still times that a TCO analysis can be a powerful tool for closing deals. By understanding how and when they work best, you can minimize risks and maximize the value of a TCO analysis. Download our Value Selling Tools Comparison to learn more about the different types of value selling tools and when and how they should be used.